Maximise your visit to Wales in 2019 with an unforgettable Welsh tour. Book a tour to see the hills, mountains, valleys, beaches, castles, rivers and ruins of wonderful Wales. Book this >	1-day tours to see Gower, Brecon Beacons National Park and Wye Valley. Daily from Cardiff. Book this > private tours, school visits, groups, conference visits, all to explore Cardiff, Wales and UK. "Our guide was fun, energetic and full of knowledge"
"You made the tour come to life!" 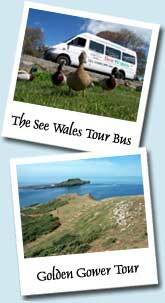 Who are See Wales Tours? "See the wonderful countryside of Wales with See Wales Tours; visiting majestic castle ruins, golden sandy beaches, ancient Roman forts, lush green hilltops, glacial-shaped valleys, rugged mountains and even the depths of a famous Welsh coal mine whilst enjoying Welsh music and Welsh Cakes along the way - whatever the weather!" Maximise your time in Wales with an unforgettable tour. Book your Wales tour now!